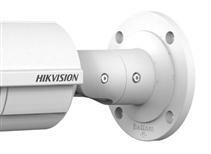 The 2MP Outdoor Bullet Camera from Hikvision utilizes a 1/2.8" progressive-scan CMOS sensor for 1920 x 1080 resolution at 30 fps, and it features a 2.8-12mm motorized varifocal lens surrounded by IR LEDs for up to 98.4' of night vision. WDR, 3D DNR, and backlight compensation enable the camera to capture clear images in ambient lighting, and saturation, brightness, contrast, and sharpness settings allow you to configure your camera depending on different environments. Additional features include one-key reset, password protection, privacy masking, watermarking, IP address filtering, and anonymous access. 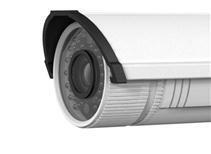 The camera will trigger an alarm when motion is detected, if someone tampers with the device, if there is a network disconnect, if there is an IP address conflict, or if a storage exception occurs. Dual streaming in H.264+, H.264, and MJPEG formats offers maximized bandwidth and customization of your network. A microSD slot supports up to 128GB of data for edge storage, however, the camera also supports NAS storage for saving larger amounts of information. Additionally, an external input and output allows you to connect a microphone and speaker to the camera for 2-way audio. 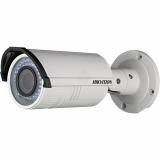 The camera is ONVIF-compliant for compatibility with other surveillance devices, and an IP66-rated housing allows you to install the camera outdoors.